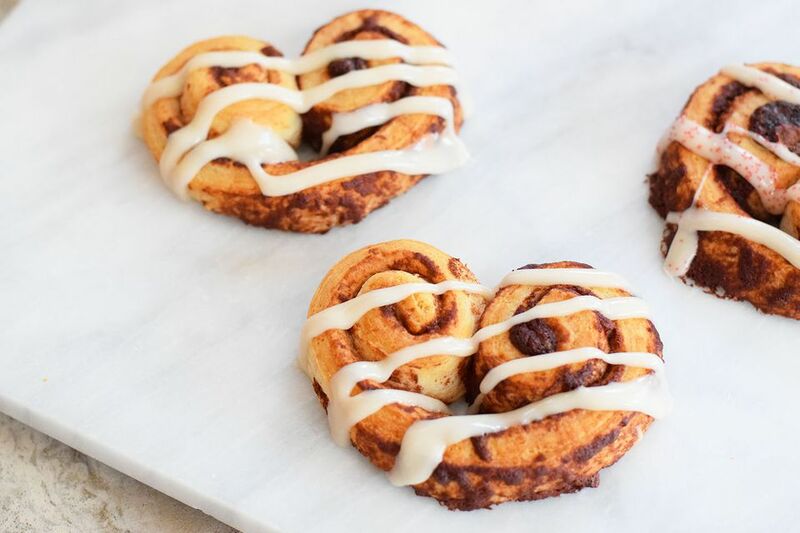 Sweet heart cinnamon rolls could not be an easier Valentine's Day breakfast treat. Especially when you use store bought cinnamon roll dough. You can of course use homemade cinnamon roll dough, but if you are in a pinch, it's super easy to use store bought dough! I've given the homemade version below, but feel free to skip all most of the steps and jump to the end if you have store bought dough! You will also won't need the icing recipe if you get the rolls that include an icing pouch! Heat the milk, butter, and sugar in a saucepan over medium heat. Just let it simmer, not boil. Remove from the heat and let it cool to lukewarm. This may take 10 minutes or so. You can transfer it to the fridge in another bowl if you need to speed up the process! Pour the yeast over the top of the milk mixture and then stir to combine. Roll out one piece at a time into a large rectangle. Leave it relatively thick, about 1/2-inch. Make sure the rectangle is long, width-wise. Think hot dog, not hamburger. Pour about 3/4 cup of butter over the dough and sprinkle about half the cinnamon and sugar over the top. Roll the dough away from you in a tight roll until it is halfway rolled up. Roll from the other side of the dough as well, so that you have two spirals touching. Cut into 2-inch sections. Grab each section and pinch the bottom underneath the touching spirals so that it looks like a heart. Place each section on a baking sheet so that they are not touching. Cover the baking sheet with a towel and repeat with the remaining dough. Let the rolls rise for about 20 minutes. Whisk together all icing ingredients until smooth. Bake rolls at 375 F for about 15 minutes, making sure not to over-bake. They should be lightly brown and slightly firm to the touch. Remove rolls from the oven and if you can manage let them cool a bit and then drizzle icing over the top. If you want them to look super festive, sprinkle with Valentine's sprinkles!